Would anyone be able to advise if Inquisit Lab is able to do this (or any other programme to support this)? How do I go about programming this task? Appreciate your advise, as programming is not my cup of tea. It's certainly possible to do using Inquisit Lab. Start with the BART script as your baseline. Add the trials and blocks for your dot memory task (presentation and recall), then run the blocks in the desired order, i.e. 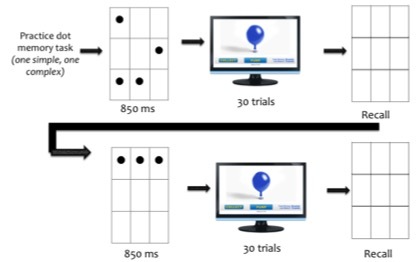 dot memory presentation block -> BART block of 30 trials -> dot memory recall block -> dot memory presentation block -> BART block of 30 trials -> dot memory recall block.